During development of the fetus, the interatrial septum develops to separate the left and right atria. However, a hole in the septum called the foramen ovale, allows blood from the right atrium to enter the left atrium during fetal development. This opening allows blood to bypass the nonfunctional fetal lungs while the fetus obtains its oxygen from the placenta. 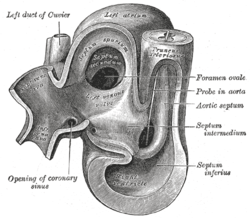 A layer of tissue called the septum primum acts as a valve over the foramen ovale during fetal development. After birth, the pressure in the right side of the heart drops as the lungs open and begin working, causing the foramen ovale to close entirely. In about 25% of adults, the foramen ovale does not entirely seal. In these cases, any elevation of the pressure in the pulmonary circulatory system (due to pulmonary hypertension, temporarily while coughing, etc.) can cause the foramen ovale to remain open. This is known as a patent foramen ovale (PFO), which is not necessarily a type of atrial septal defect. However, it is closely associated. Ebstein's anomaly – about 50% of individuals with Ebstein anomaly have an associated shunt between the right and left atria, either an atrial septal defect or a patent foramen ovale. 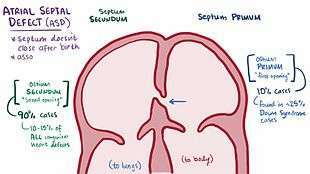 The secundum atrial septal defect usually arises from an enlarged foramen ovale, inadequate growth of the septum secundum, or excessive absorption of the septum primum. About 10 to 20% of individuals with ostium secundum ASDs also have mitral valve prolapse. 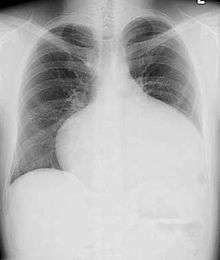 An ostium secundum ASD accompanied by an acquired mitral valve stenosis is called Lutembacher's syndrome. Most individuals with an uncorrected secundum ASD do not have significant symptoms through early adulthood. More than 70% develop symptoms by about 40 years of age. Symptoms are typically decreased exercise tolerance, easy fatigability, palpitations, and syncope. While pulmonary hypertension is unusual before 20 years of age, it is seen in 50% of individuals above the age of 40. Progression to Eisenmenger's syndrome occurs in 5 to 10% of individuals late in the disease process. A patent foramen ovale (PFO) is a small channel that has some hemodynamic consequence; it is a remnant of the fetal foramen ovale (/fəˈreɪmən oʊˈvæli, -ˈvɑː-, -ˈveɪ-/), which normally closes at birth. In medical use, the term "patent" (/ˈpeɪtənt/) means open or unobstructed. In about 25% of people, the foramen ovale fails to close properly, leaving them with a PFO or at least with what some physicians classify as a "pro-PFO", which is a PFO that is normally closed, but can open under increased blood pressure. On echocardiography, shunting of blood may not be noted except when the patient coughs. Clinically, PFO is linked to stroke, sleep apnea, migraine with aura, and decompression sickness. No cause is established for a foramen ovale to remain open instead of closing naturally, but heredity and genetics may play a role. The mechanism by which a PFO may play a role in stroke is called paradoxical embolism. In the case of PFO, a blood clot from the venous circulatory system is able to pass from the right atrium directly into the left atrium via the PFO, rather than being filtered by the lungs, and thereupon into systemic circulation toward the brain. PFO is common in patients with atrial septal aneurysms (ASA) which are also linked to cryptogenic (i.e. of unknown cause) strokes. PFO is more prevalent in patients with cryptogenic stroke than in patients with a stroke of known cause. While PFO is present in only 25% in the general population, the probability of someone having a PFO increases to about 40 to 50% in patients who have had a cryptogenic stroke. Statistically speaking, this is particularly true for patients who have a stroke before the age of 55. PFO is not treated in the absence of other symptoms, and no consensus exists on treatment of PFO even in the presence of transient ischemic attack or stroke. Moreover, no "gold standard" treatment option is known. However, treatments for PFO include surgical closure and percutaneous device closure, as well as medical therapies such as anticoagulant therapy, and antiplatelet agents. Research studies of the efficacy of surgical closure treatments versus medical therapies of PFOs in preventing the recurrence of strokes have been conducted; the results are mixed, although “as-treated” and “per-protocol” analyses were positive for closure devices. As an outcome of data from the 10-year RESPECT trial—and breaking a long history of inconclusiveness for the viability of successful prevention of stroke via PFO closure—as of May 2016 a majority of FDA advisors are reported to be supportive of an Amplatzer PFO closure device for stroke prevention. However, "the entire strategy has proved to be one of the most polarizing topics in cardiovascular medicine, often pitting cardiologists in favor of closure against neurologists dead set against it". PFO closure devices may be implanted via catheter-based procedures, and using a variety of closure devices, though no devices are as yet approved by the FDA specifically for the purpose of PFO closure. Debate exists within the neurology and cardiology communities about the role of a PFO in cryptogenic neurologic events such as strokes and transient ischemia attacks without any other potential cause. Some data suggest that PFOs may be involved in the pathogenesis of some migraine headaches. Several clinical trials are currently underway to investigate the role of PFO in these clinical situations. A defect in the ostium primum is occasionally classified as an atrial septal defect, but it is more commonly classified as an atrioventricular septal defect. Ostium primum defects are less common than ostium secundum defects. This is type of defect is usually associated with Down Syndrome. 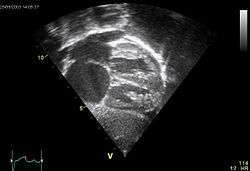 Ultrasound picture of the heart, seen in a subcostal view: The apex is towards the right, the atria are to the left. ASD secundum seen as a discontinuation of the white band of the atrial septum. The enlarged right atrium is below. The enlarged pulmonary veins are seen entering the left atrium above. In the case of a large ASD (> 9 mm), which may result in a clinically remarkable left-to-right shunt, blood shunts from the left atrium to the right atrium. This extra blood from the left atrium may cause a volume overload of both the right atrium and the right ventricle. If untreated, this condition can result in enlargement of the right side of the heart and ultimately heart failure. Any process that increases the pressure in the left ventricle can cause worsening of the left-to-right shunt. This includes hypertension, which increases the pressure that the left ventricle has to generate to open the aortic valve during ventricular systole, and coronary artery disease which increases the stiffness of the left ventricle, thereby increasing the filling pressure of the left ventricle during ventricular diastole. 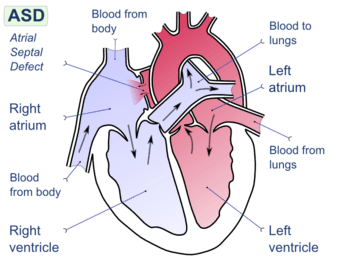 The left-to-right shunt increases the filling pressure of the right heart (preload) and forces the right ventricle to pump out more blood than the left ventricle. This constant overloading of the right side of the heart causes an overload of the entire pulmonary vasculature. Eventually, pulmonary hypertension may develop. 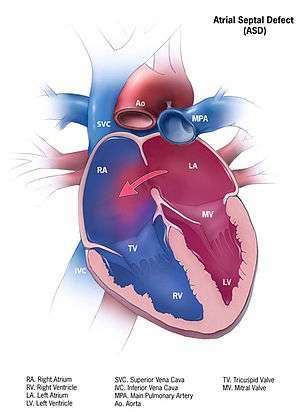 The pulmonary hypertension will cause the right ventricle to face increased afterload. The right ventricle is forced to generate higher pressures to try to overcome the pulmonary hypertension. This may lead to right ventricular failure (dilatation and decreased systolic function of the right ventricle). If the ASD is left uncorrected, the pulmonary hypertension progresses and the pressure in the right side of the heart becomes greater than the left side of the heart. This reversal of the pressure gradient across the ASD causes the shunt to reverse - a right-to-left shunt. This phenomenon is known as Eisenmenger's syndrome. Once right-to-left shunting occurs, a portion of the oxygen-poor blood gets shunted to the left side of the heart and ejected to the peripheral vascular system. This causes signs of cyanosis. Some individuals with an ASD have surgical correction of their ASD during childhood. The development of signs and symptoms due to an ASD are related to the size of the intracardiac shunt. Individuals with a larger shunt tend to present with symptoms at a younger age. Adults with an uncorrected ASD present with symptoms of dyspnea on exertion (shortness of breath with minimal exercise), congestive heart failure, or cerebrovascular accident (stroke). They may be noted on routine testing to have an abnormal chest X-ray or an abnormal ECG and may have atrial fibrillation. If the ASD causes a left-to-right shunt, the pulmonary vasculature in both lungs may appear dilated on chest X-ray, due to the increase in pulmonary blood flow. Upon auscultation of the heart sounds, a systolic ejection murmur may be heard that is attributed to the pulmonic valve, due to the increased flow of blood through the pulmonic valve rather than any structural abnormality of the valve leaflets. In unaffected individuals, respiratory variations occur in the splitting of the second heart sound (S2). During respiratory inspiration, the negative intrathoracic pressure causes increased blood return into the right side of the heart. The increased blood volume in the right ventricle causes the pulmonic valve to stay open longer during ventricular systole. This causes a normal delay in the P2 component of S2. During expiration, the positive intrathoracic pressure causes decreased blood return to the right side of the heart. The reduced volume in the right ventricle allows the pulmonic valve to close earlier at the end of ventricular systole, causing P2 to occur earlier. In individuals with an ASD, a fixed splitting of S2 occurs because the extra blood return during inspiration gets equalized between the left and right atria due to the communication that exists between the atria in individuals with ASD. The right ventricle can be thought of as continuously overloaded because of the left-to-right shunt, producing a widely split S2. Because the atria are linked via the atrial septal defect, inspiration produces no net pressure change between them, and has no effect on the splitting of S2. Thus, S2 is split to the same degree during inspiration as expiration, and is said to be “fixed”. If agitated saline is injected into a peripheral vein during echocardiography, small air bubbles can be seen on echocardiographic imaging. Bubbles traveling across an ASD may be seen either at rest or during a cough. (Bubbles only flow from right atrium to left atrium if the right atrial pressure is greater than left atrial). Because better visualization of the atria is achieved with transesophageal echocardiography, this test may be performed in individuals with a suspected ASD which is not visualized on transthoracic imaging. Newer techniques to visualize these defects involve intracardiac imaging with special catheters typically placed in the venous system and advanced to the level of the heart. This type of imaging is becoming more common and involves only mild sedation for the patient typically. If the individual has adequate echocardiographic windows, use of the echocardiogram to measure the cardiac output of the left ventricle and the right ventricle independently is possible. In this way, the shunt fraction can be estimated using echocardiography. 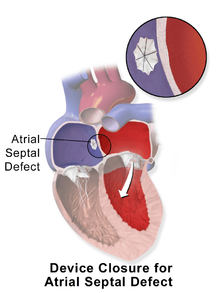 The ECG findings in atrial septal defect vary with the type of defect the individual has. Individuals with atrial septal defects may have a prolonged PR interval (a first-degree heart block). The prolongation of the PR interval is probably due to the enlargement of the atria common in ASDs and the increased distance due to the defect itself. Both of these can cause an increased distance of internodal conduction from the SA node to the AV node. In addition to the PR prolongation, individuals with a primum ASD have a left axis deviation of the QRS complex, while those with a secundum ASD have a right axis deviation of the QRS complex. Individuals with a sinus venosus ASD exhibit a left axis deviation of the P wave (not the QRS complex). A common finding in the ECG is the presence of incomplete right bundle branch block, which is so characteristic that if it is absent, the diagnosis of ASD should be reconsidered. Once someone is found to have an atrial septal defect, a determination of whether it should be corrected has to be made. Surgical mortality due to closure of an ASD is lowest when the procedure is performed prior to the development of significant pulmonary hypertension. The lowest mortality rates are achieved in individuals with a pulmonary artery systolic pressure less than 40 mmHg. If Eisenmenger's syndrome has occurred, a significant risk of mortality exists regardless of the method of closure of the ASD. 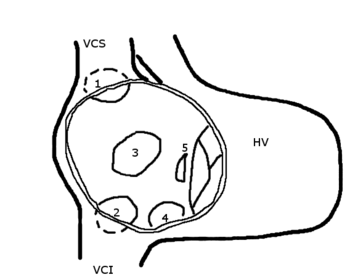 In individuals who have developed Eisenmenger's syndrome, the pressure in the right ventricle has raised high enough to reverse the shunt in the atria. If the ASD is then closed, the afterload that the right ventricle has to act against has suddenly increased. This may cause immediate right ventricular failure, since it may not be able to pump the blood against the pulmonary hypertension. Closure of an ASD in individuals under age 25 has been shown to have a low risk of complications, and individuals have a normal lifespan (comparable to a healthy age-matched population). Closure of an ASD in individuals between the ages of 25 and 40 who are ,but have a clinically significant shunt, is controversial. Those who perform the procedure believe they are preventing long-term deterioration in cardiac function and preventing the progression of pulmonary hypertension. Percutaneous device closure involves the passage of a catheter into the heart through the femoral vein guided by fluoroscopy and echocardiography. An example of a percutaneous device is the Cardia PFO occluder which has discs that can expand to a variety of diameters at the end of the catheter. The catheter is placed in the right femoral vein and guided into the right atrium. The catheter is guided through the atrial septal wall and one disc (left atrial) is opened and pulled into place. Once this occurs, the other disc (right atrial) is opened in place and the device is inserted into the septal wall. This type of PFO closure is more effective than drug or other medical therapies for decreasing the risk of future thromboembolism. Drug therapy can be used to minimize risk of thromboembolism and stroke in PFO. Anticoagulants, such as warfarin, are commonly used to reduce blood clotting, whereas antiplatelet agents, such as aspirin, are used to reduce platelet aggregation and thrombosis. Prior to correction of an ASD, an evaluation is made of the severity of the individual's pulmonary hypertension (if present at all) and whether it is reversible (closure of an ASD may be recommended for prevention purposes, to avoid such a complication in the first place. Pulmonary hypertension is not always present in adults who are diagnosed with an ASD in adulthood). If pulmonary hypertension is present, the evaluation may include a right heart catheterization. This involves placing a catheter in the venous system of the heart and measuring pressures and oxygen saturations in the superior vena cava, inferior vena cava, right atrium, right ventricle, and pulmonary artery, and in the wedge position. Individuals with a pulmonary vascular resistance (PVR) less than 7 wood units show regression of symptoms (including NYHA functional class). However, individuals with a PVR greater than 15 wood units have increased mortality associated with closure of the ASD. Until the early 1990s, surgery was the usual method for closing all ASDs. Now, due to medical advances, doctors can use catheter procedures to close secundum ASDs, the most common type. During the procedure, the doctor inserts a thin, flexible tube into a vein in the groin (upper thigh) and threads it to the heart's septum. The catheter has a tiny, umbrella-like device folded up inside it. When the catheter reaches the septum, the device is pushed out of the catheter and positioned so that it plugs the hole between the atria. The device is secured in place and the catheter is withdrawn from the body. Within 6 months, normal tissue grows in and over the device. No need exists to replace the closure device throughout the patient's life. Doctors often use echocardiography (echo) or transesophageal echo (TEE), as well as angiography, to guide them in threading the catheter to the heart and closing the defect. TEE is a special type of echo that takes pictures of the heart through the esophagus. Catheter procedures are much easier on patients than surgery because they involve only a needle puncture in the skin where the catheter is inserted. This means that recovery is faster and easier. The outlook for patients having this procedure is excellent. Closures are successful in more than 90% of patients, with no significant leakage. Rarely, a defect is too large for catheter closure and surgery is needed. Percutaneous closure of an ASD is currently only indicated for the closure of secundum ASDs with a sufficient rim of tissue around the septal defect so that the closure device does not impinge upon the superior vena cava, inferior vena cava, or the tricuspid or mitral valves. The Amplatzer Septal Occluder (ASO) is commonly used to close ASDs. The ASO consists of two self-expandable round discs connected to each other with a 4-mm waist, made up of 0.004– to 0.005-inch Nitinol wire mesh filled with Dacron fabric. Implantation of the device is relatively easy. The prevalence of residual defect is low. The disadvantages are a thick profile of the device and concern related to a large amount of nitinol (a nickel-titanium compound) in the device and consequent potential for nickel toxicity. If a net flow of blood exists from the left atrium to the right atrium, called a left-to-right shunt, then an increase in the blood flow through the lungs happens. Initially, this increased blood flow is asymptomatic, but if it persists, the pulmonary blood vessels may stiffen, causing pulmonary hypertension, which increases the pressures in the right side of the heart, leading to the reversal of the shunt into a right-to-left shunt. Reversal of the shunt occurs, and the blood flowing in the opposite direction through the ASD is called Eisenmenger's syndrome, a rare and late complication of an ASD. Venous thrombus (clots in the veins) are quite common. Embolizations (dislodgement of thrombi) normally go to the lung and cause pulmonary emboli. In an individual with ASD, these emboli can potentially enter the arterial system, which can cause any phenomenon attributed to acute loss of blood to a portion of the body, including cerebrovascular accident (stroke), infarction of the spleen or intestines, or even a distal extremity (i.e., finger or toe). Some recent research has suggested that a proportion of cases of migraine may be caused by PFO. While the exact mechanism remains unclear, closure of a PFO can reduce symptoms in certain cases. This remains controversial; 20% of the general population has a PFO, which for the most part, is asymptomatic. About 20% of the female population has migraines, and the placebo effect in migraine typically averages around 40%. The high frequency of these facts finding statistically significant relationships between PFO and migraine difficult (i.e., the relationship may just be chance or coincidence). In a large randomized controlled trial, the higher prevalence of PFO in migraine patients was confirmed, but migraine headache cessation was not more prevalent in the group of migraine patients who underwent closure of their PFOs. As a group, atrial septal defects are detected in one child per 1500 live births. PFOs are quite common (appearing in 10–20% of adults), but asymptomatic, so undiagnosed. ASDs make up 30 to 40% of all congenital heart diseases that are seen in adults. The ostium secundum atrial septal defect accounts for 7% of all congenital heart lesions. This lesion shows a male:female ratio of 1:2. 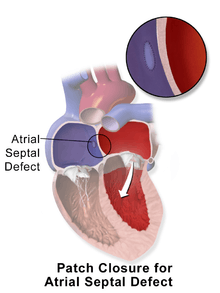 ↑ "Atrial Septal Defect Information - The Mount Sinai Hospital". ↑ Kumar, Vinay (2007). Robbins Basic Pathology (8th ed.). Philadelphia: Saunders/Elsevier. p. 384. ISBN 1416029737. ↑ "Ostium Secundum Atrial Septal Defects". WebMD. Medscape. Retrieved 5 November 2012. 1 2 Vis, JC; Duffels, MG; Winter, MM; Weijerman, ME; Cobben, JM; Huisman, SA; Mulder, BJ (May 2009). "Down syndrome: a cardiovascular perspective.". Journal of intellectual disability research : JIDR. 53 (5): 419–25. doi:10.1111/j.1365-2788.2009.01158.x. PMID 19228275. ↑ Cherry, C; DeBord, S; Moustapha-Nadler, N (June 2009). "Ebstein's anomaly: a complex congenital heart defect.". AORN Journal. 89 (6): 1098–110; quiz 1111–4. doi:10.1016/j.aorn.2009.03.003. PMID 19606562. ↑ p.119 Jaypee Brothers, First Edition 2014, ISBN 978-93-5152-140-2. ↑ Bossert, T; Walther, T; Gummert, J; Hubald, R; Kostelka, M; Mohr, FW (October 2002). "Cardiac malformations associated with the Holt–Oram syndrome – report on a family and review of the literature.". The Thoracic and cardiovascular surgeon. 50 (5): 312–4. doi:10.1055/s-2002-34573. PMID 12375192. Retrieved 7 November 2012. ↑ Leachman R, Cokkinos D, Cooley D (1976). "Association of ostium secundum atrial septal defects with mitral valve prolapse". Am J Cardiol. 38 (2): 167–9. doi:10.1016/0002-9149(76)90144-2. PMID 952260. ↑ "foramen". Merriam-Webster Dictionary. , "ovale". Merriam-Webster Dictionary. .
↑ "patent". Medical Dictionary. TheFreeDictionary.com. September 1, 2014. Retrieved 2015-03-26. ↑ 2013, Boston Childrens Hospital. "Patent Foramen Ovale Symptoms & Causes - Boston Children's Hospital". ↑ "Patent Foramen Ovale - Texas Heart Institute Heart Information Center". ↑ "Patent Foramen Ovale (PFO)". ↑ Furlan AJ, Reisman M, Massaro J, Mauri L, Adams H, Albers GW, Felberg R, Herrmann H, Kar S, Landzberg M, Raizner A, Wechsler L (2012). "Closure or medical therapy for cryptogenic stroke with patent foramen ovale". The New England Journal of Medicine. 366 (11): 991–9. doi:10.1056/NEJMoa1009639. PMID 22417252. 1 2 3 4 Freixa X, Arzamendi D, Tzikas A, Noble S, Basmadjian A, Garceau P, Ibrahim R (2014). "Cardiac procedures to prevent stroke: patent foramen ovale closure/left atrial appendage occlusion". The Canadian Journal of Cardiology. 30 (1): 87–95. doi:10.1016/j.cjca.2013.11.008. PMID 24365193. 1 2 Homma, Shunichi; Sacco, Ralph L; Di Tullio, Marco R; Sciacca, Robert R; Mohr, JP (2002). "Effect of medical treatment in stroke patients with patent foramen ovale: patent foramen ovale in Cryptogenic Stroke Study". Circulation. 105 (22): 2625–31. doi:10.1161/01.CIR.0000017498.88393.44. PMID 12045168. ↑ "Patent Foramen Ovale Treatment & Management: Medical Care, Surgical Care, Complications" – via eMedicine. ↑ "Treatment of atrial septal abnormalities (PFO, ASD, and ASA) for prevention of stroke in adults". ↑ Bang, Oh Young; Lee, Mi Ji; Ryoo, Sookyung; Kim, Suk Jae; Kim, Ji Won (30 September 2015). "Patent Foramen Ovale and Stroke–Current Status". 17 (3): 229–237. doi:10.5853/jos.2015.17.3.229. PMC 4635723 . PMID 26437990. ↑ Medicine, Cleveland Clinic Journal of. "Patent foramen ovale and the risk of cryptogenic stroke : Cleveland Clinic Journal of Medicine". ↑ "Clinical Trials Registry - Internet Stroke Center". 1 2 "RESPECT Confirms Long-term Safety, Efficacy of PFO Closure for Recurrent Stroke - Thursday - TCTMD". ↑ "Majority of FDA Advisors Give Green Light to Amplatzer PFO Closure Device for Stroke - Daily News - TCTMD". ↑ "How is a Patent Foramen Ovale (PFO) Closed Using a Catheter-based Procedure?". Cleveland Clinic. Retrieved 20 July 2016. ↑ Brauser, Deborah (16 October 2015). "RESPECT 10-Year Data Strengthens Case for PFO Closure After Cryptogenic Stroke". Medscape. Retrieved 20 July 2016. 1 2 McCandless RT, Arrington CB, Nielsen DC, Bale JF, Minich LL (2011). "Patent foramen ovale in children with migraine headaches". The Journal of Pediatrics. 159 (2): 243–7.e1. doi:10.1016/j.jpeds.2011.01.062. PMID 21450305. ↑ "Atrial Septal Defect Types – Mayo Clinic". Archived from the original on 28 September 2007. Retrieved 2007-10-14. ↑ Fix, James D.; Dudek, Ronald W. (1998). Embryology. Baltimore: Williams & Wilkins. p. 52. ISBN 0-683-30272-8. 1 2 Skelley, Tao Le, Vikas Bhushan, Nathan William. First aid for the USMLE step 2 CK (8th ed.). New York: McGraw–Hill Medical. p. 357. ISBN 978-0-07-176137-6. ↑ Davia J, Cheitlin M, Bedynek J (1973). "Sinus venosus atrial septal defect: analysis of fifty cases". Am Heart J. 85 (2): 177–85. doi:10.1016/0002-8703(73)90458-4. PMID 4569755. ↑ Valdes-Cruz, L. M.; Cayre, R. O. (1998). Echocardiographic diagnosis of congenital heart disease. Philadelphia. 1 2 John, J; Abrol, S; Sadiq, A; Shani, J (Jul 26, 2011). "Mixed atrial septal defect coexisting ostium secundum and sinus venosus atrial septal defect.". Journal of the American College of Cardiology. 58 (5): e9. doi:10.1016/j.jacc.2010.11.077. PMID 21777739. Retrieved 17 June 2012. ↑ Glen, S.; J. Douglas. (1995). "Transcranial doppler monitoring. (letter to editor)". South Pacific Underwater Medicine Society Journal. 25 (2). ISSN 0813-1988. OCLC 16986801. Retrieved 2008-04-06. ↑ Clark E, Kugler J (1982). "Preoperative secundum atrial septal defect with coexisting sinus node and atrioventricular node dysfunction". Circulation. 65 (5): 976–80. doi:10.1161/01.CIR.65.5.976. PMID 7074763. 1 2 Schneider, B. and Bauer, R. (2005). “Is Surgical Closure of Patent Foramen Ovale the Gold Standard for Treating Interatrial Shunts? An Echocardiographic Follow-up Study”. Journal of the American Society of Echocardiography 18(12):1385–1391. 1 2 3 4 Spies, C., Strasheim, R., Timmermanns, I., Schraeder, R. (2006). “Patent foramen ovale closure in patients with cryptogenic thrombo-embolic events using the Cardia PFO occlude”. European Heart Journal (27): 365–371. ↑ Bjørnstad P (2006). "Is interventional closure the current treatment of choice for selected patients with deficient atrial septation?". Cardiol Young. 16 (1): 3–10. doi:10.1017/S1047951105002027. PMID 16454871. ↑ Lier H, Schroeder S, Hering R (2004). "Patent foramen ovale: an underrated risk for divers?". Dtsch Med Wochenschr. 129 (1–2): 27–30. doi:10.1055/s-2004-812652. PMID 14703578. ↑ Saary M, Gray G (2001). "A review of the relationship between patent foramen ovale and type II decompression sickness". Aviat Space Environ Med. 72 (12): 1113–20. PMID 11763113. ↑ Adams H (2004). "Patent foramen ovale: paradoxical embolism and paradoxical data". Mayo Clin Proc. 79 (1): 15–20. doi:10.4065/79.1.15. PMID 14708944. ↑ Azarbal B, Tobis J, Suh W, Chan V, Dao C, Gaster R (2005). "Association of interatrial shunts and migraine headaches: impact of transcatheter closure". J Am Coll Cardiol. 45 (4): 489–92. doi:10.1016/j.jacc.2004.09.075. PMID 15708691. ↑ Dowson, Andrew; Mullen, MJ; Peatfield, R; Muir, K; Khan, AA; Wells, C; Lipscombe, SL; Rees, T; De Giovanni, JV; Morrison, WL; Hildick-Smith, D; Elrington, G; Hillis, WS; Malik, IS; Rickards, A (18 March 2008). "Migraine Intervention With STARFlex Technology (MIST) trial: a prospective, multicenter, double-blind, sham-controlled trial to evaluate the effectiveness of patent foramen ovale closure with STARFlex septal repair implant to resolve refractory migraine headache.". Circulation. 117 (11): 1397–404. doi:10.1161/CIRCULATIONAHA.107.727271. PMID 18316488. ↑ Kaplan S (1993). "Congenital heart disease in adolescents and adults. Natural and postoperative history across age groups". Cardiol Clin. 11 (4): 543–56. PMID 8252558. ↑ Feldt R, Avasthey P, Yoshimasu F, Kurland L, Titus J (1971). "Incidence of congenital heart disease in children born to residents of Olmsted County, Minnesota, 1950–1969". Mayo Clin Proc. 46 (12): 794–9. PMID 5128021. Goldman, Lee (2011). Goldman's Cecil Medicine (24th ed.). Philadelphia: Elsevier Saunders. pp. 270, 400–401. ISBN 1437727883.